Chinese company Woniu.com recently came out with a new martial arts based MMO call the The Ninth Sutra （九阴真经). 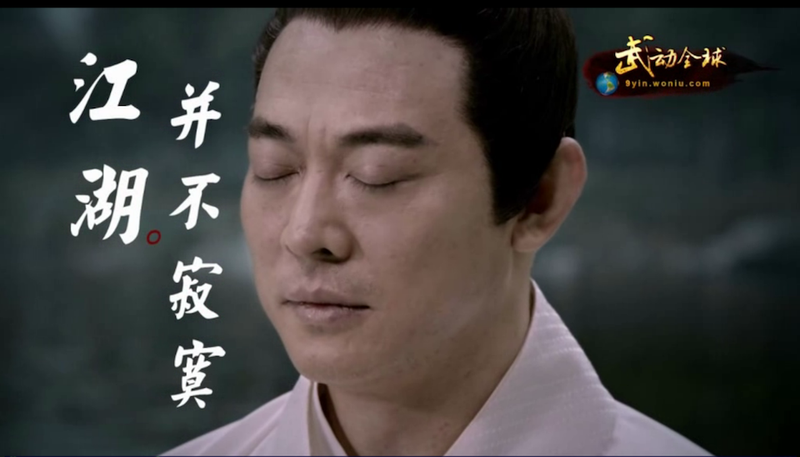 Despite looking like every other martial arts based MMO ever released, the one thing that set the The Ninth Sutra apart was the fact that they were able to use martial arts expert Jet Li's image in their promotional material. Piqued by the premise that Li would give his image to a seemingly run of the mill online RPG, I had to test it out. At first glance The Ninth Sutra looks and feels like pretty much every other martial arts based fantasy MMO. Its use of colors and lighting is highly reminiscent of Joymax's Silk Road Online. Graphically the game isn't much to look at; there are loads of other MMO's in China that have better graphics. Supposedly (and I mean just talking with some random guy without a shirt on inside an internet cafe, supposedly), the game is more story oriented in that "it's all about the story." Right when you start off in The Ninth Sutra you are hit with plot. Set in a Louis Cha martial arts fantasy universe, the story branches out depending on the decisions of the player. At the very beginning, the player is given the choice of three story lines to choose from (there are four options but the fourth seemed locked). The decision that the player makes decides which of the main sects of kung fu the player character starts out from—this could be any of the six major sects of martial arts fantasy (including the Wu Tang Clan) and two random historical groups added to round the number out. After choosing a story line involving revenge, I was ready to begin the game. To my great displeasure I found that my character was in the Heavenly Palace sect instead of the Wu Tang Clan. Getting started, I was bombard with way too much text that I didn't know where to begin to read. Soon after a quick tutorial on how to move (you move with AWSD instead of click), I started the introductory quests. I know I've said it before but I think Chinese MMOs are improving on the MMO formula, particularly with auto run features. Like some other Chinese MMOs, The Ninth Sutra also incorporates an auto run to NPC feature. After about 15 minutes of NPC "training" I was off to experience the in-game world and fight my way to becoming the supreme leader of all of martial arts. The Ninth Sutra's battle system is a quite an interesting one, such as how its basic controls aren't point and click, and the games battle system also isn't point and click (instead the game relies on hotkeys and combos). Early in the game, the player has limited access to weapons; this is mostly because early monsters don't drop enough material or gold for players to purchase equipment. This combo based battle system is quite entertaining, particularly because early on you're fighting monsters such as boars bare handed. It was exhilarating watching my on screen character perform feats of acrobatics and martial arts to only do 6 point damage onto a boar that was doing 10+ damage to me (in the end I beat the boar). On top of the interesting story, the programers decided to add in some elements of monster hunter to the mix, particularly the carving of defeated foes for loot. Now at this point, you're probably asking yourself why the title of this impression is insinuating that the game is bad. This game isn't bad, in fact its one of better MMOs I've played since being in China, so much so that I've actually downloaded the game to my PC (not the one I'm writing this article on but another computer), but this is also a very lengthy game. Starting out it took me about 3 hours before I was really able to fight any monsters. In fact, when I first started the game I was killed by a boar. There is a lot of text to read and loads of "starter" quests to read through before the game actually starts, because there aren't any pointers or hints and because the screen is so filled with text early on it becomes hard to figure out what to do. All of this sounds like whining but if you try it out you'll get see what I mean. Also, for you Mac users out there, like every other Chinese made MMO there isn't a Mac client.